You know how important the holidays can be for your business. It’s your last chance to drive sales, hit your yearly goals, and set yourself up for success in the year ahead. According to the National Retail Federation, the holiday season brings in 20-40 percent of yearly sales for small and mid-sized retailers. Better yet, sales in November and December 2015 are forecasted to increase 5.7 percent from the previous year, giving you the perfect opportunity to have your best holiday season yet. While the holiday season is chock full of opportunity, you can be sure your business won’t be the only one vying for your customers’ attention. Email marketing is proven to be one of your best tools for reaching your audience, and persuading them to shop with you. But to make a stand-out impression, you may have to spend a little extra time perfecting your message and avoiding the common mistakes that could cost you valuable opportunities. Don’t get caught up trying to fill your email with holiday cheer. No matter what the season, your emails need to look like they’re coming from you. Be sure to incorporate your business’s brand by adding your logo, brand colors, and unique voice to every email you send out. Take a look at the “Festive Friday” email sent out by No Rest for Bridget. Throughout the month of December, the store promoted seasonal deals, all while keeping their brand consistent. Of course, you can add in some festive touches — but don’t go overboard. Stick to one or two small details, so you don’t risk distracting readers from your message. You know better than anyone how many great gift ideas your business has to offer. But when it comes to your holiday sales email, sometimes less is more. Too many options can overwhelm your readers — especially those who are opening from mobile devices. Take some time to rethink your lengthy emails and come up with a plan to highlight just a few of your very best sellers. Use an email template that works well on mobile and keep your content concise. You can always encourage people to visit your website to view more of your business’s offerings. You can also show off more of your products or services by sending different mailings to different people. Think about what will be valuable to specific groups of people on your list and send them something tailored to their interests. 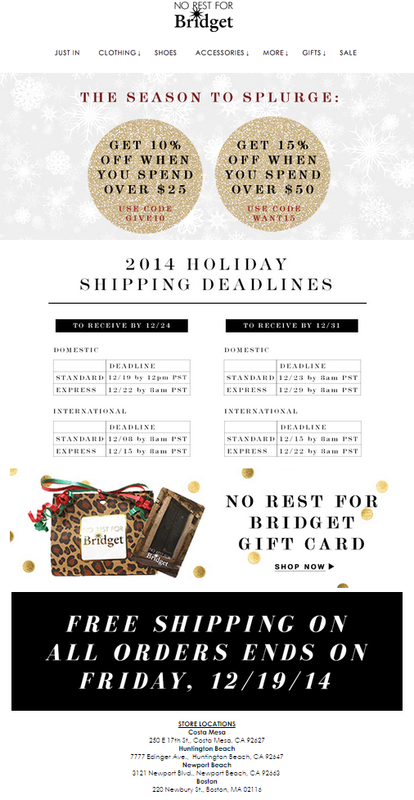 Here’s an example of a shipping deadline reminder that No Rest for Bridget sent only to their online shoppers. The more relevant your emails are to your audience the more likely they are to take action and open your future mailings. If you’re still working with one large mailing list, use these steps to organize your contacts into smaller, more targeted groups. Timing is always an important part of marketing, but never is this truer than during the holiday season. To make the most of the holidays, think about how you can leverage important dates like Black Friday (November 27), Small Business Saturday (November 28), and Cyber Monday (November 30). Last year, Constant Contact customers sent over 1.3 billion emails in the week leading up to Cyber Monday. For your emails to stand out, think about how you can go above and beyond what you normally offer. This could be a special discount, free shipping, complimentary gift wrapping, or discounted gift cards. Plan to send your shopping incentive out on one of the major shopping holidays and make your emails extremely easy to act on. While email may be your most valuable communication tool this season, that doesn’t mean you should disregard social media altogether. 64 percent of holiday shoppers seek out gift ideas on social media — making your emails shareable could introduce your business to a totally new pool of holiday shoppers. Encouraging your audience to share your promotions is also great for contacts who are interested in your offer, but don’t want to buy it for themselves. Remind your audience to share your promotions so their friends can get in on the deal. Sharing your offer on Facebook, retweeting a promotional tweet, or pinning a product on Pinterest will get your business in front of an audience that likely has similar interests to your existing customer base. You can also extend the reach of your email campaigns with Constant Contact’s Facebook Advertising tool, which allows you to promote your email to a larger audience of targeted people, who haven’t yet connected with your business online. Just make sure your offer doesn’t expire too quickly — promoted posts can show up in Facebook feeds for a couple weeks, so you want to make sure the email you promote is still relevant to anyone who views it. You can find out more about Constant Contact’s Facebook Advertising tool here. Ready to rock the holidays at your business? Get more holiday marketing tips here.